Seattle Repeals Tax On Big Business After Opposition From Amazon, Starbucks The companies funded opposition to the tax that would have raised money to help with Seattle's ongoing homeless problem. Critics worried about homelessness growing despite millions spent already. 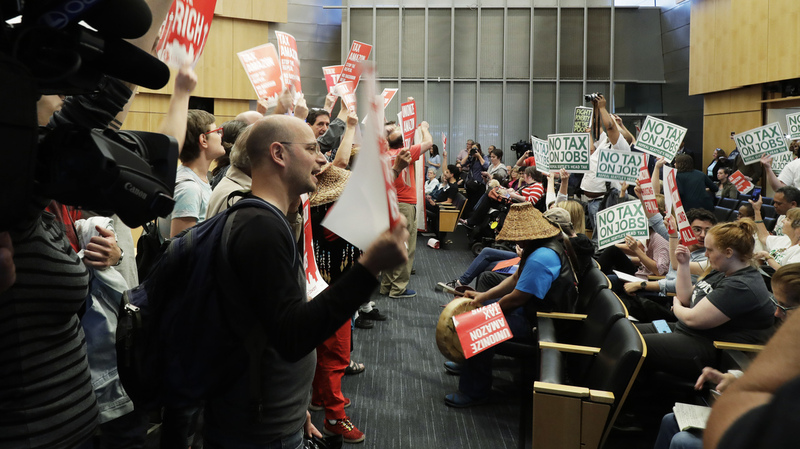 Supporters and opponents of a tax face off at Seattle City Hall on Tuesday. It was a sharp reversal from just last month, when the council voted unanimously to pass the tax and the city's mayor signed it into law. Amazon, Starbucks and other companies then funded a campaign against the tax and to put it on a referendum to voters in November. Council member Lisa Herbold said the groups opposing the tax had "unlimited resources" and that her vote to repeal was "counter to my values as a person." However, a campaign from business groups including the Chamber of Commerce had convinced most Seattle residents to oppose the tax and "we don't have the time and we don't have the resources necessary to change enough minds," Herbold said. "This is not a winnable battle at this time," she added. Seattle's government said the tax would only affect about 3 percent of the city's employers — those grossing at least $20 million each year. About 585 employers would have paid about $275 per employee per year, according to the city council. Amazon has about 45,000 employees in Seattle and is the city's largest private employer. It would have paid about $12 million per year. Amazon's CEO Jeff Bezos was named the world's richest man by Forbes in March, with a worth of $112 billion. The company said the vote "to repeal the tax on job creation is the right decision for the region's economic prosperity." Amazon, Starbucks and investment company Vulcan each paid $25,000 toward the referendum effort, KUOW reports. The No Tax on Jobs campaign raised $350,000. After the session to consider repealing the law was announced a day earlier, Seattle's Chamber of Commerce said it was a "breath of fresh air." The Chamber echoed language from Amazon that it was a "tax on jobs." "From day one, the Seattle Metro Chamber has been clear that a tax on jobs is not the way to address the regional homelessness crisis," President and CEO Marilyn Strickland said in a statement Monday. The law passed in May was itself a watered-down version of the original plan, to tax companies $500 per employee. Amazon temporarily halted construction of a tower in downtown Seattle in opposition. Seattle Mayor Jenny Durkan said she would sign the repeal into law. "Instead of engaging in a prolonged, expensive political fight, the City and I will continue to move forward on building real partnerships that align our strategies from business, advocates, philanthropy," she said in a statement. Council members Teresa Mosqueda and Kshama Sawant both voted against the repeal. Sawant called it a "cowardly betrayal of the needs of working people," saying it was "capitulation and it's a betrayal." Critics of the tax reportedly saw the city's homeless problem growing, despite large amounts of spending by the city already. Seattle spent $68 million on fighting homelessness in 2017, according to The Associated Press. The city council said 8,522 people were counted as "experiencing homelessness" in Seattle in 2017. Including nearby areas, that number went up to 12,000 during a one-night count in January, the AP says, which is up 4 percent from the year before. The wire service says 169 homeless people died in 2017. KUOW reports that the characterization of the tax as "extra money for homelessness ... wasn't necessarily an accurate representation." "It's possible the money wouldn't have been extra: It could have plugged a future hole in the budget instead. Seattle had already been spending money from its construction boom on homelessness. With a depleted general fund projected to sink into the red, the city needed to find money just to stay afloat." "I'm very supportive of the homeless," small business owner Claudia Campanile told the station. "But I am not supportive of the constituency getting taxed with no representation and no clear game plan of what they're going to do with the funds." The mayor seemed to address that concern in her statement Tuesday, saying, "people deserve to know how their money is being spent and what is working. The City has worked towards increased accountability and transparency with taxpayer dollars expected to be spent on the homelessness crisis." Cities across the country are competing to host Amazon's proposed second headquarters. The company says it would create 50,000 jobs and would invest $5 billion in the city it chooses — leading some competing for the headquarters to promise billions in tax breaks for the corporate behemoth.